Objectives: To determine the frequency of secondary haemorrhage in patients undergoing tonsillectomy. 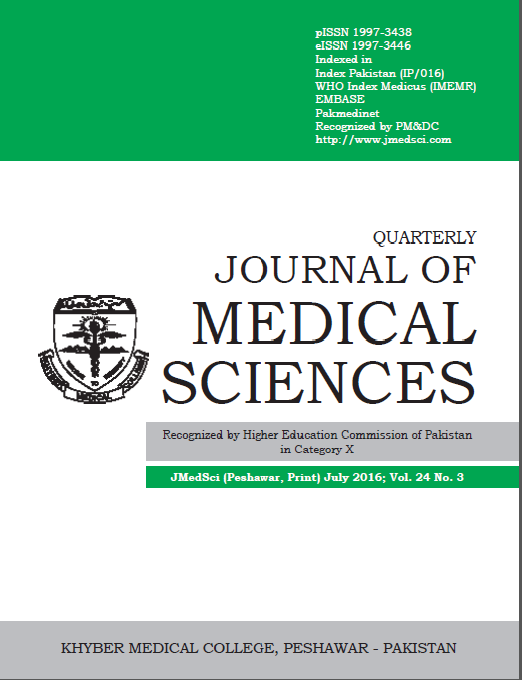 Material and Methods: This descriptive study including 177 patients was performed in the department of ENT, Head and Neck Surgery , Khyber Teaching Hospital, Peshawar from October 2014 to October 2015. Patients with chronic tonsillitis undergoing tonsillectomy of both gender and age above 4 years were included. The patient’s demographic data, age and gender were recorded in a preformed proforma. Results: In this study mean age was 20 years ± 0.24 SD. Sixty two percent patients were male while 38% patients were female. Twelve percent patients had secondary haemorrhage while 88% patients have not secondary haemorrhage. cover should be give in all tonsillectomy patients at least for 10 days.